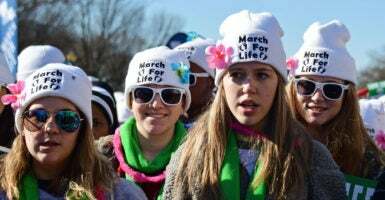 A poll released Tuesday just ahead of the 46th March for Life demonstration in Washington, D.C, shows the majority of Americans support tighter restrictions on abortion, and would even like to see the landmark Roe v. Wade decision “reinterpreted” to allow more restrictions. Now in its 11th year, the poll, which randomly selected and surveyed 1,066 American adults about their opinion exclusively on abortion, found that 83 percent of Americans agree that laws can protect both the health and well-being of a woman and the life of the unborn. “The abortion landscape in terms of where Americans are is substantially different from what you might glean from the way the debate sometimes plays out in terms of an all-or-nothing scenario,” said Andrew Walther, vice president of communications and strategic planning at the Knights of Columbus. Additionally, the findings show that between 2008 and 2019 the percent of Americans who identify as pro-life and pro-choice bounced between 40 and 60 percent. For this reason, said Marist Poll Director Barbara Carvalho on a call with reporters, the terms surrounding the debate mischaracterize and oversimplify Americans’ opinions on abortion. With 3 in 4 Americans in support of substantial restrictions on abortion, “the American public is more in line with the March for Life than the Women’s March regarding abortion,” Carvalho added. The Women’s March is schedule for Jan. 19, immediately following the March for Life.